If you're in charge of picking out the Christmas lights and decorations for your homeowner's association entrance, you have a weighty responsibility on your shoulders. That's because the entrance to your HOA forms visitors' very first impression of your neighborhood. And if you're not careful, you can give first time visitors the distinct impression that they're entering Scroogeville. But your task involves much more than simply providing a favorable first-time impression to visitors. In fact, that might be considered the lesser concern. Because more importantly, your entrance decorations will need to please the people that live in your neighborhood. HOA members, after all, pass through your HOA entrance on a daily basis as they escape from the cold, cruel world and return to their haven of home-sweet-home. And the decorations you choose for your HOA entrance will give them a delightfully warm and fuzzy feeling. Or repulse them. Or somewhere in between. You're going for the warm-and-fuzzy end of the spectrum, of course. And hoping to stay well clear of repulse-them territory. Here are a few tips for achieving both goals. No matter the specific types of Christmas lights and décor you choose for your entrance, you'll be wise to avoid going cheap. That means avoiding the big-box stores when you're shopping for your lights and decorations. It's very simple: The big-box guys thrive on the principle of buy cheap, sell cheap. And when you buy cheap, you get cheap. That's OK for some things. That's OK for many things, in fact. But it's not OK for Christmas lights and décor. The cheap decorations you buy won't last long. That's certainly a consideration. But arguably, it's not the most important consideration. Perhaps more importantly, those cheap decorations will look cheap - there's an astounding difference between cheap LED Christmas lights and high-end lights. And the same is true of garlands, bows, wreaths, ornaments and other Christmas décor. So where should you shop for your decorations? You're already there - right here on this website. Yes, that's a self-serving answer for us. But it's an answer that will also serve you well. That's because we specialize in Christmas-related décor; it's all we do. And our reputation - our very survival - depends upon selling only quality products that satisfy customers and keep them coming back for more. As you select lights and décor for your HOA entrance, try to strike a balance between nighttime décor and daytime décor. Lights, of course, are best seen at night. And other items such as wreaths and garlands might be less visible at night - depending, to a degree, upon how well lit your entrance is. So you'll want to avoid relying upon any one type of décor in carrying the bulk of the burden in decorating your entrance. Choose a blend of day-oriented and night-oriented decorations. 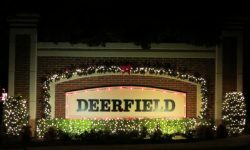 A common feature with HOA entrances is a large, monument-style sign that carries the name of the HOA, and sometimes includes a brief message of greeting. Often constructed of brick or stone, these signs are often quite massive and imposing, and are the natural center of attention of many HOA entrances. So it only makes sense that these signs serve as the centerpiece of holiday decorations. An excellent - and often overlooked - way to do that is with our sign enhancers. They're available in a range of different sizes, themes, and designs. And they're purpose-made for mounting on large, monument-style signs. A less costly but still impressive way to highlight your entrance sign is through the use of garlands. 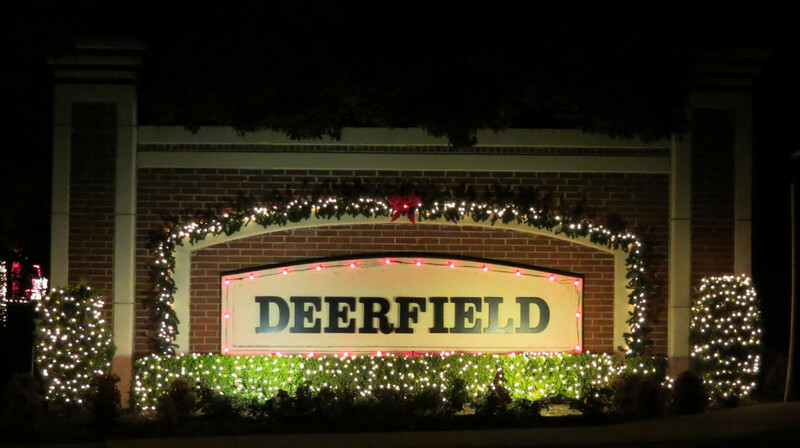 With a bit of creativity, a garland can add a delightful holiday-themed accent to your sign. There's something about a Christmas wreath that just seems to convey a sense of warm welcoming. That's why wreaths are so often placed at entranceways to homes and businesses - quite frequently hung right on the door. Wreaths can be used to help your HOA entrance provide that same warm sense of welcoming to your visitors. A particularly effective way to use wreaths is to mount them in pairs, one on each side of the entrance sign. Our wreaths are available in sizes ranging from 3 feet in diameter all the way up to 6 feet. So no matter the size of your entryway sign, you'll be able to find wreaths that are sized perfectly. And they're suitable for both indoor and outdoor use. Though Christmas, at its root, is a religious holiday, Christmas decorations don't have to convey a religious overtone. It's quite possible to create a wonderful Christmas display for your entryway without relying upon religious symbolism. And while it may not be true for every HOA, in most neighborhoods it's probably best to remain religion-neutral with your holiday displays. As noted at HOALeader.com, incorporating religious symbolism in your display risks offending someone. It's a tricky question, though. Some HOA's might be just fine with a religious-themed display. But consider this issue carefully as you're designing your display. We offer plenty of religious-neutral décor, if that's the direction you choose to go. The tips above will apply in general to all HOA entrances. But each HOA is unique. So no single entrance design will be optimal for all HOA entrances. Your design should be customized to your HOA entrance. Use other HOA entry decorations you've seen for inspiration. But make your entryway Christmas decorations as unique and special as the neighborhood it serves. Admittedly, that's sometimes easier said than done. But we have decades of experience in creating custom designs for outdoor Christmas decorations. So if you need a little help in coming up with a just-right plan for your entryway décor, we'll be glad to help. That's what we're here for.